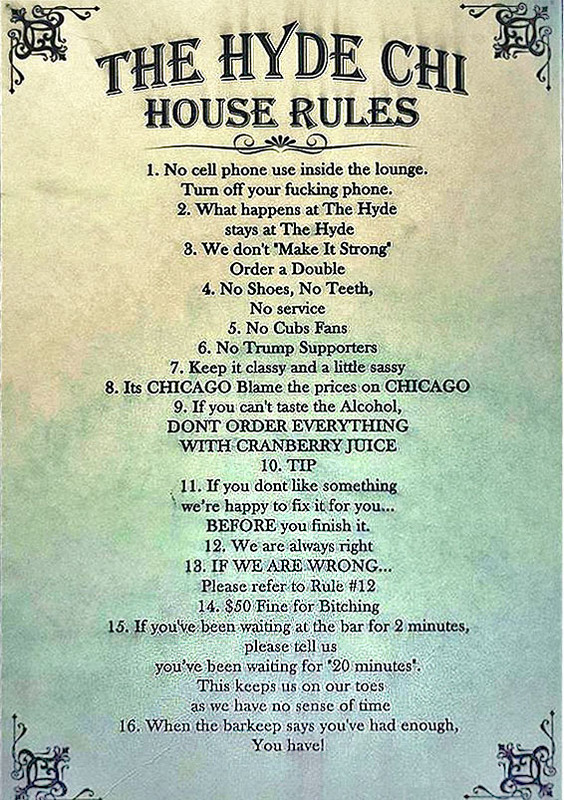 A Chicago publican has earned some publicity and stirred a little controversy by posting rules regarding the political views and even sports teams of its patrons. The Hyde is a password-protected speakeasy-style drinking den that opened in the windy city’s Hyde Park on 18 January. Despite its prohibition-reminiscent persona, it has done a terrible job of staying underground and in good stead with the authorities, attracting headlines across the US for its tongue-in-cheek policies, which include “No Trump Supporters”. Owner Jovanis Bouargoub has tried to explain ‘the rules’ were intended to be a guide to the easy-going ambiance, not an attempt to exclude anyone. “There’s no room for negative people in our house. If you don’t understand the industry and are ignorant to the humour in this then do us a favour and hit that unfollow button,” he said in an Instagram post. While so far attracting over 2,200 Likes, the house rules have garnered a mildly viral 816 comments*, including a healthy number of jovial approvals, but a backlash from Chicago die-hards in defence of The Cubs, and a dark smear of unforgiving contempt by loyalists to the witch-hunted #45. The reaction is reminder that neither politics nor religion are safe ground for inviting public opinion in pubs. Comments get to the Likes, the greater the implication of an unpopular post.